Many of the paintings in this wonderful exhibit are of animals caught in weird, imaginary mutations, as if the natural world and human culture have crashed into each other so hard and so irretrievably that the animals have taken the genomes of our capitalist world into their DNA. Visiting the show may give the sensation of being an observer into a strange place where an unnatural fecund nature has taken over – like the shimmer zone in Jeff VanderMeer’s Southern Reach novels, where alien forces have altered the genetic structures of living things and created new and beautiful but dangerous mysteries. A performing elephant decorated with wallpaper patterns balances on a ball; a pelican vomits plastic toys and debris as if to feed its young with the regurgitated trash of industrial society; a snowman is impossibly charred black, with burned sticks protruding from its round body. 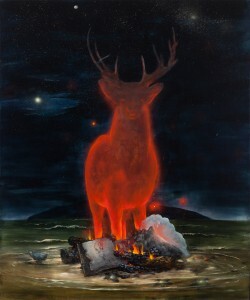 In Sloan’s fantastic paintings the natural order is out of order. The elements are inverted and a biological alchemy has twisted our expectations back on themselves, the world turned out of sync. These allegorical paintings are unexplained, which sometimes leaves us with the same feeling that reading about the shimmer does – when they catch our attention and invite closer study, as they often do, we may learn a lot more about the imagery, but not necessarily learn much more about what they might mean. This isn’t a bad thing, for experiencing mystery is pleasurable and exciting. Must we ask for an explanation of an image to appreciate it? Paintings are sensual tools, meant to provoke interest and speculation, created for the purpose of inviting an audience to share the painter’s world for a while, and we don’t have to have everything spelled out in black and white to fall in love with them – like a deep relationship, sometimes the mysteries of a painting unfold themselves slowly. We love solving puzzles, and when we examine Sloan’s works a little more carefully, they often reward us with layers of meaning. For example, his painting, The Delicate Flowers at first appears to be an amusing image of a circus elephant performing a surprising balancing act on a ball on a tightrope stretched over a primordial landscape, it’s a fun, appealing image. 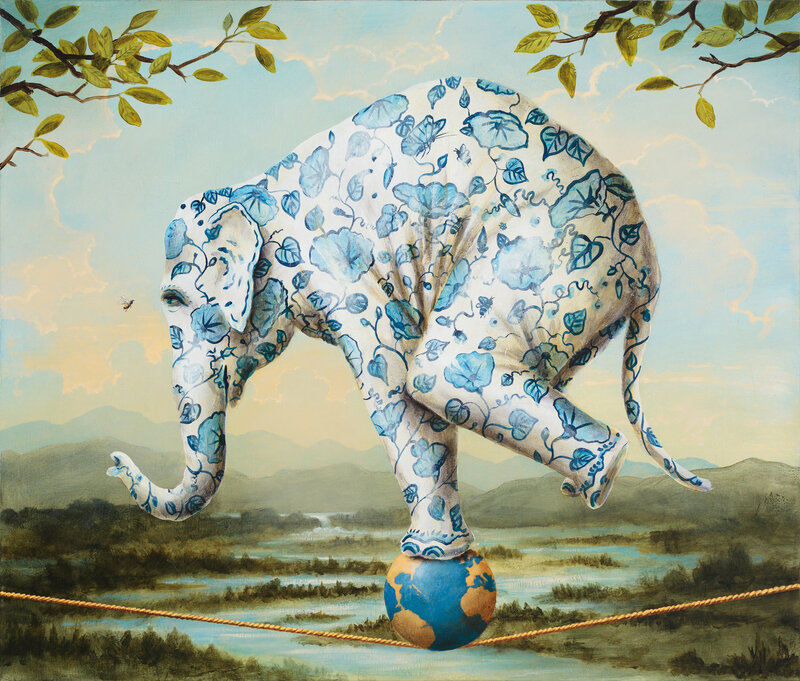 But reading an allegorical image doesn’t stop at the surface – when we spend time with the painting and look closer we notice that the ball is the image of our world, that the elephant is decorated in the patterns of blue-and-white porcelain, and that a fly is buzzing close to its head with potentially catastrophic results should it distract it. The painting transforms from being superficial to something more substantial. On the surface, these are easy-access, pretty things, but with a little attention the images turn into something more meaningful, more important – and it’s this sleight of hand that makes Sloan’s paintings so enticing and tempting. While the paintings immediately invite enjoyment and pleasure, when we give them a little time they also provoke thought about our interaction with the environment. Although Sloan has created images of a dream-like vision of the world that sometimes feels disturbing, this is a dream in which we are given the flexibility to ask ourselves about our impact on the environment. But this aspect of his work doesn’t overtly and excessively embrace some politically jaundiced point of view. Instead, it provides us with an honestly conservative standpoint, a thoughtful concern with the way nature is forced to interact with unsustainable human practices. The show is delightfully sentimental – and I mean that as a compliment; for paintings and sculptures that make an appeal to our human nature are much needed in these frightening times. But here and there we are given reminders of the cruel consequences of living in wild lands. 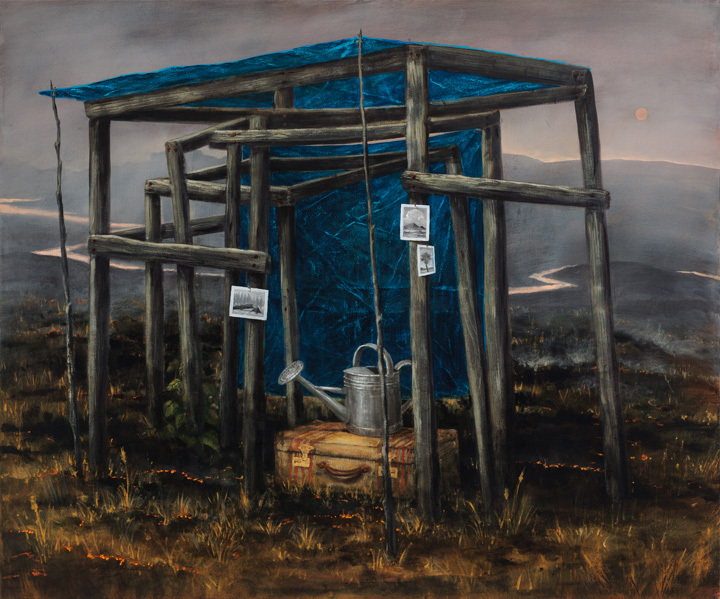 The burning land surrounding a rickety Escher-like structure in his painting The Inheritance will resonate with many people in his audience in Thousand Oaks, CA, where wildfires have swept through neighborhoods already reeling from the mass-shooting at Borderline, a popular country music club. The fragile building is charred but still standing, although flames lick the grass around it. How fragile our civilization is in the face of natural forces. 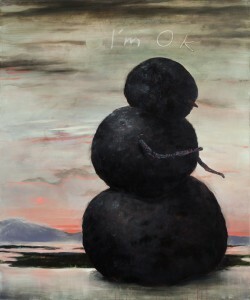 And a painting of an impossibly burned and blackened snowman called Saint Snow will catch the attention of many. “I’m OK” is written above the figure in a child’s handwriting – we’re not OK here, and we won’t be for a while, but if a snowman can survive the conflagration, so can we, although scarred and transformed by the experience. Sloan’s animal studies are reminiscent of the natural history paintings of ornithologist John James Audobon, whose delicate prints of American birds decorate rooms across the United States, and his landscapes reveal his admiration for the lovely paintings of the Hudson River school, who looked at the pristine landscape with wonder, painting it as a sublime spectacle to be cherished and regarded with awe. These are good, solid American roots for an American painter to have. 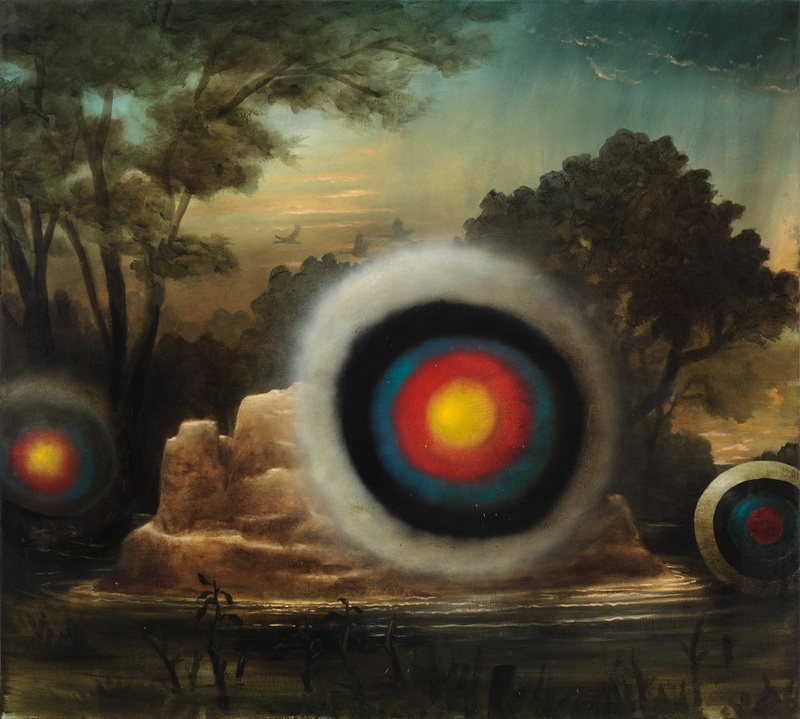 Sloan’s paintings are excellent examples of superb 21st-century imaginative realism, the popular genre which has flourished as avant-gardism has lost its grip on the art world. They will delight and amuse, cause reflection and perhaps, if we let them, make us more mindful of the need for care for the natural world, and give us a moment for reflection upon the fragility of the relationship between our consumer society and the environment. Don’t miss this show – Kevin Sloan’s wonderful paintings will help us to heal, like a restorative tonic that refreshes and revives. Kevin Sloan is a Denver based painter who primarily works with acrylic on canvas and occasionally draws and paints on paper. Growing up in Des Moines, Iowa, his early interest in art was nurtured by student classes at the Des Moines Art Center and by their Artist in Residence Frank Limone. It was clear upon high school graduation that he would study art in college. He received a BFA in Painting from Tyler School of Art, where he studied with Stephen Greene and Stanley Whitney. In 1984, he continued his formal education at the University of Arizona, where he received an MFA in Painting and studied with James G. Davis. His curiosity and love of travel led him to live and work in a wide variety of cities across the United States, including San Francisco, New York City, New Orleans, Key West, and Santa Fe. All of these locales have had a lasting impact on his practice. In addition to his studio practice, he participates in one-person and group exhibits. 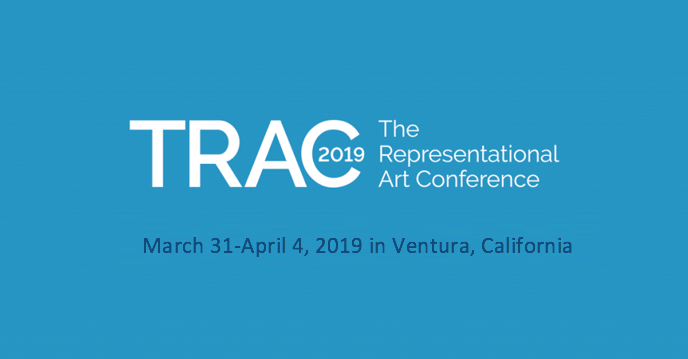 Not only does he teach upper-division painting classes in Denver, but he is also a visiting artist in residence at universities around the country. His work is found in numerous private and public collections worldwide, including the Israel Museum, the Phoenix Art Museum, the Museum of Fine Arts in Santa Fe, the Tampa Museum of Art, and the Tucson Museum of Art.